You will find The Minecraft Quiz 1 a quiz to widen and check how many pieces of information on Minecraft you have collected. 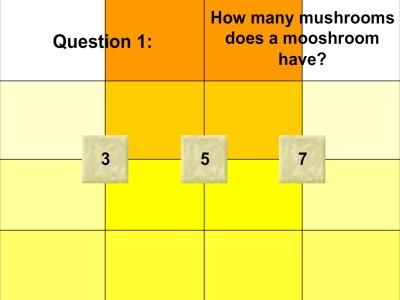 Most of the questions go deep into the details of Minecraft such the number of mushrooms that a mooshroom has. Each question usually has 3 options and you need to click at one. One wrong answer takes you back to the beginning. However, a right answer will show on the top. Some players find the questions useful, and some players are fond of the way the background and questions are presented on the screen. Have fun and gain helpful information! You click at the correct option by using the mouse.